Mira Sinha-Bhattacharjea (1930-2009) was a founding member of the China Study Group, former Director of the ICS, Editor of the journal, China Report, Co-Chairperson, ICS, and Emeritus Fellow, ICS. She joined the Indian Foreign Service in 1955, before leaving four years later and subsequently joining the Department of Chinese and Japanese Studies (now the Department of East Asian Studies) at the University of Delhi where she taught Chinese Foreign Policy for over a quarter of a century and left an indelible mark on the minds of her students. MSB's scholarship as reflected in both the classroom and in her writings had two distinct but inter-related elements — the ability to understand the broad view, paradigm or the framework governing a policy and the capacity to take into account every little detail to make sense of a situation and to discern the trends. Not only did she author numerous scholarly works, including a book, ‘China, the World, and India’, but also wrote frequently in newspapers about China and Sino-Indian relations. As Director and later as co-chairperson of the ICS, MSB was a great institution-builder and encouraged the professional growth of young China scholars. 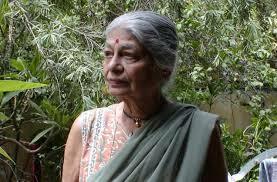 The Mira Sinha-Bhattacharjea Award has been instituted by the ICS in her memory. It comprises prize money of Rs.25,000/- and is awarded to the best paper presented by a young scholar under the age of 40 at the annual All India Conference of China Studies. 2017 MSB Award - Sankalp Gurjar, for the best paper at the 10th All India Conference of China Studies held at Goa University, Goa from 12-14 December 2017. Mr.Gurjar is a doctoral candidate at South Asia University, New Delhi and wins the Award for his paper, ‘Chinese Maritime Activities in the Indian Ocean Maritime Africa’. 2016 MSB Award - Samar Tyagi, for the best paper at the 9th All India Conference of China Studies held at Mumbai University, Mumbai from 14-16 December 2016. Mr.Tyagi is a Project Associate at the Dept. of Humanities & Social Sciences, IIT Roorkee, Uttarakhand and wins the Award for his paper, ‘Tracking Chinese Aid in Africa: A Panel Data Analysis’. 2014 MSB Awad - Jigme Yeshe Lama, for the best paper at the 7th All India Conference of China Studies held at Benares Hindu University, Varanasi from 14-16 November 2014. Mr. Lama is a PhD Scholar from Jawaharlal Nehru University and wins the Award for his paper, ‘Impact of China’s Economic Reforms on State Society Relations in Tibet – Growth of Secularisation of Religious Elements’. The ICS also wishes to highly acclaim two other scholars for their papers. These are Mr. Mrutyunjay Kumar Swain, Senior Research Officer, Sardar Patel University, Vallabh Vidyanagar, Gujarat for his paper, ‘Historical Perspectives, Impacts and Adaptation with Drought in India and China’ and Mr. P. K. Anand, Research Assistant, Institute of Chinese Studies for his paper, ‘The Changing Labour Relations in China and the All-China Federation of Trade Unions (ACFTU)’. 2013 MSB Award - Dhriti Roy, Assistant Professor, Department of Chinese, School of Language and Literature, Sikkim Central University for her paper titled, "Chinese Humanist Thought on State and Society - Is There Something to Learn From Ancient Chinese Philosophical Writings for Modern Governments?" presented at the 6th All India Conference of China Studies, organized by the ICS at the Indian Institute of Management, Kozhikode, 12-14 December 2013.